Brooklyn Unfiltered, a seasonal release by the New York brewery is now available. This Keller pilsner is a classic German style and hazy by design – not clarified (and typically not pasteurized). This kellerbier is brewed with Saaz, Saphir, and Hallertau hops and contains a lot of the original yeast in suspension. The brewery expects some of yeast and malt haze to fall to the bottom of the bottle, so swirl and drink. Brooklyn Unfiltered is available now through March in 12-ounce bottles and draft. According to Brooklyn Brewery, being cool is a complicated thing. Perhaps unattainable if you try. It’s just something that you just are. Some people just experience a flash of cool. A fleeting moment. That’s where Brooklyn Bel Air Sour comes in. It’s intended to taste how cool feels. If just for a few moments. Whatever that means. This month, Brooklyn Bel Air Sour will appear in 12 ounce bottles for the first time. Brewery brewmaster Garrett Oliver created the recipe, and Lab manger Drew Bombard used his specially cultivated thermophilic Lactobacillus bacteria souring culture. This particulur strain is very unique to the brewery and its fermentation processes. (In other words, you home brewers won’t be able to purchase this commercially.) The result is something cool and tart. Brooklyn saw great success in the dry-hopped Bel Air Sour last summer – a hoppy and tart reward for months of hard work. Simply put, Bel Air Sour tastes like being cool feels. It’s genuine, un-ironic, and surprisingly inviting. There’s a peachy, fruity tartness to it that feels like having someone compliment you on your choice of Hawaiian shirt. The eye-catching gold color turns your glass into a fashion statement. Brooklyn Bel Air Sour debuts in 12 ounce bottles for the first time in January. Brooklyn Tripel Burner, a future big bottle from the New York based brewery. This is no regular tripel. Brooklyn Tripel Burner features licorice, a bevy of spices, and bourbon barrel oak aging. According to ancient Chinese beliefs,the “Triple Burner” was responsible for the flow of energy throughout the body. Triple Burner tonics often included licorice root to encourage “natural sweetness & a light, joyful presence.” Bourbon oak barrels, a licorice spice blend from the wizard lior Lev Sercarz, & a robust tripel base create Tripe! Burner, a heady, aromatic ale to be paired with a state of serenity. Brooklyn Tripel Burner will be a 750 milliliter bottle release. Brooklyn Brewery is suing Fresno’s Black Ops Brewing in the state of California. The focus of the suit is over the “Black Ops” name. This source of the suit might be a little more obvious than brewery legal entanglements. Brooklyn Black Ops, (the brewery’s barrel aged beer that doesn’t exist, but does if you’ve seen the marketing) was first released in 2007. Brooklyn owns a trademark for Black Ops. Brooklyn Brewery has a solid case here as its trademarks – BROOKLYN BLACK OPS and/or BLACK OPS – are similar to the BLACK OPS BREWING trademark. This is especially true given that courts typically discount portions of trademarks that are merely descriptive of the associated goods and services, like “brewing” in the BLACK OPS BREWING trademark. Also, notably, Black Ops Brewing applied for a federal trademark registration for its name, but the application was rejected based on Brooklyn Brewery’s trademark registration for BROOKLYN BLACK OPS. Brooklyn Brewing mentions in the suit, a cease and desist was issued in August. 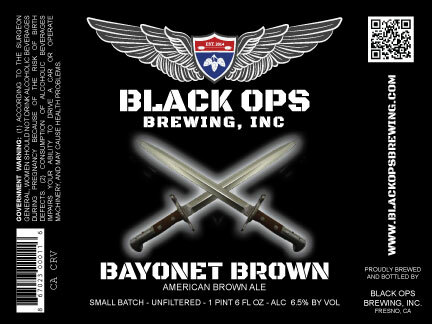 Below, the proposed artwork for Black Ops Brewing’s Bayonet Brown Ale.